This review is a guest post by my wonderful aunt-in-law, or rather my sister's wonderful aunt-in-law A.C. Enjoy! 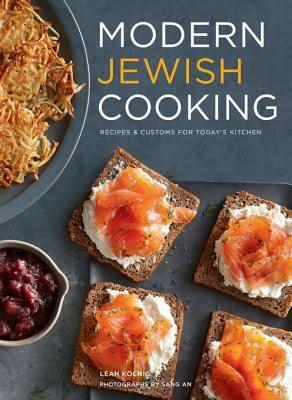 "Modern Jewish Cooking. Recipes & Customs for Today's Kitchen". The book is full of beautiful photographs by Sang An, whose work has appeared in many magazines, including Martha Stewart Living and Real Simple. The recipes in the book cover marvelous range of "Jewish Cooking". You will find so many treats, from well-known Ashkenazi favourites like "Chicken Soup", "Kugel" and even "Gribenes" (crispy chicken fat renderings), an excellent recipe for "Bagels", to exotic Sephardic dishes, many of them vegetarian. The Middle Eastern inspired recipes range from "Matbucha Salad", "Roast Chicken with Fennel and Orange", Leah's creative "Tahini, Roasted Fig and Pistachio Sundaes", to a tasty "Spinach Shakshuka". As well, there are Jewish Italian recipes, and a superb "Ethiopian Chicken Stew". Everywhere there are Leah's innovations and interesting new takes on the traditional. I had one criticism of the book. In the recipe for the classic dish "Kasha Varnishkes", Leah neglected to brown the kasha (buckwheat groats), first, after coating it in beaten egg, before adding the boiling water (better to use broth) to cook the kasha. Browning the kasha makes a big difference to the taste when added, along with fried onions, to the bow tie noodles (Varnishkes). And I would make one suggestion, if you buy the book, and decide to try the delicious "Potato Latke" recipe - rather than squeezing the starchy water out of the grated potato/onion mixture in a tea towel (messy and onerous), you should try using a salad spinner. It works perfectly. After the demonstration in August, Leah autographed the copy of her book for Eleanore. It's taken me several months to test some of the recipes, copy my favourites, and write this review. Now it's time, sadly, to turn the book over to Eleanore! *Disclaimer: the book was provided to me by Raincoast Publishing for the purpose of testing and review.